stay low on AP and click on the treasure chest you want to open/fight. 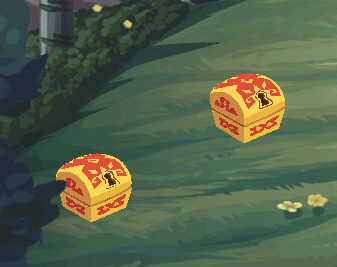 If it's a heartless but you want a treasure chest, just don't refill your ap and find another, the other way around if you find a tresure chest but want a heartless. If you happen to be hunting the high-level enemies and don't want to open the normal chests, you can also watch and see if your character jumps at the chest to enter combat. If it's a normal chest, they'll walk the whole way. There's plenty of time to click away and save your AP. yeah, but waiting to see the shaking is borin (and if, like me, you play on LOW quality it's really hard to see). If they're visible on-screen when you enter an area, you can also see them spawning in like Heartless! What does get you better rewards: fighting LV333 pretenders or opening blue chests? Defeating the LV666 enemies is out of questions for me. Killing L333s. It's a rest week for almost all of us, plus there are Heartless missions as well. Though I'll recommend killing L666s if it took you 40-80AP every single time. Thanks, 80AP would only be possible if I boost my cards. I found another way to differentiate the two. This only works in low quality, but they render differently. The one on the left is a heartless, you can see all 4 sides of the diamond on the top of the box. The one on the right is a chest, the diamond looks more like a C.
Hope this helps. I find this faster than waiting for it to jiggle. It's the same for the blue chests. sorry for breaking the good news. not work for me, because i touch the C shape one (in another world, especially agrabah) and i fought a Pretender. maybe i will stick to shake and no shake. It works for me! That's a pretty fantastic observation. Thanks for sharing! ^ Yup! I just compared to the list I've posted at the walkthrough thread, and all of them have the diamond on it. I love how all of us are just tromping around in low quality mode in the first place. Flash is a nightmare. No problem, glad I can be useful! I'm glad you got it working for you gnurtanio. Bumping this, since we're having another Pretender event. Check the walkthrough thread. Please.